D Wade scored 29 points, rookie Mario Chalmers set a franchise record with 9 steals, and the Heat scored 12 straight points in the fourth to pull away and go on to beat the Sixers 106-83 on Wednesday night. Wade added seven rebounds, six assists and five steals. Michael Beasley finished with 17 points, and Shawn Marion, who sported the mask to protect his broken nose, added 12 points and seven rebounds for Miami. Thaddeus Young scored 12 of his 19 points in the first quarter for Philadelphia, which got 16 points from Lou Will and a double double from Elton Brand (12 and 12). Andre Miller finished with 11 points and six assists for the 76ers (2-3), while Iggy who has been struggling to find his rhythm of late was held to only two points. Next up for the Sixers is Dwight Howard and the Orlando Magic tonight from Amway Arena. The Sixers might have found their answer(s) to last seasons 3 point shooting woes. New Sixers Kareem Rush and Donyell Marshall went a combined 6-for-7 from 3-point range and combined for 22 points last night against the Kings. Thaddeus Young scored 18 points, Lou Williams had 17 and the 76ers led by as many as 40 points in a 125-91 rout of the winless Sacramento on Monday night. 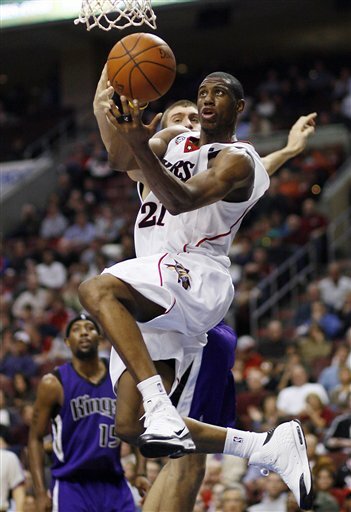 Willie Green scored 16 points and Elton Brand had 15 for the Sixers, who were up 20 points at halftime. Jason Thompson scored 17 points and Spencer Hawes had 15 for the Kings (0-4), who can’t wait to head home after a dreary season-opening road trip. The Kings, off to their worst start since 1997-98, open a four-game homestand on Wednesday against Memphis. Philadelphia travels to Miami where they will face the Heat on Wednesday night. No, seriously though, did anyone actually keep Comcast on and watch this game? I watched the first and second quarters and some parts of the second half. The first quarter was absolutely ridiculous, the Sixers scored a season high 37 points in the first, and Iggy didn’t even have a bucket. It was up and down, run and gun, exciting basketball, that was actually fun to watch. Iggy steal here, Dalembert block there, Willie Green “in rhythm for two”. Calvin Booth even had a monster jam off an Iggy steal and assist. They finished the half on a tear ending with a season high 72 points, doubling up their counterpart who went into the locker room down 36. Oh and Thaddeus Young, Rookie of the Year candidate as of last night. He is playing incredible basketball, and had a sick dunk last night, in the second quarter I believe, off of a Lou Will steal that he muscled away from Fred Jones (? – I think). Thad finished the game with 20 points on 8-11 shooting from the field and added 8 boards. First things first, I must apologize to Mo Cheeks about my prior post. He did a great job last night; keeping the tempo up, managing to get 9 players at least 20 minutes each, and really confusing Isiah Thomas with his defensive game-plan. Congrats on the big win, on the eve of your new contract. Tough few games coming up on the schedule. The 76ers get to face Orlando two of the next three games with a “should” win game at Miami in between. After that they hit the road for three tough games; at Golden State, at Phoenix, and at the Clippers (easy). Keep it up boys. I wouldn’t mind attending a playoff game from the box. So the Sixers (21-30) have won three in a row and have moved to one-half game out of the eighth and final Eastern Conference playoff position. Is this something to get excited about? In their three-game winning streak, they have beat the likes of the Washington Wizards, the Miami Heat (worst team in the league), and the LA Clippers. This is by no means a streak to brag about, yet a streak of three games that they SHOULD win, no matter what. The real test will come tonight as they host the Dallas Mavericks (34 – 16) and All-Star Dirk Nowitzki. However, one bright spot of late has been rookie Thaddeus Young. The 6-foot-8, 220-pound Young, a natural small forward, has started five of the last six games at power forward and played quite well. He’s averaging 12.0 points, 5.8 rebounds and shooting 26-for-48 (50.4 percent) as a starter. He will need to keep his production up as the Sixers have a pretty favorable schedule in the upcoming weeks. Following tonight’s tough matchup against Dallas, they get Memphis, on the road at Minnesota, back home against the troubled Knicks, tough one at Orlando, then what should be an easy W at Miami. The Sixers will need at least four wins out of those six games to stay in the playoff picture.